Wastewater from the Aug. 5, 2015, Gold King Mine spill fills the Animas River and flowed into other waterways in Colorado, New Mexico and Utah. New Mexico officials have sent the Environmental Protection Agency a bill to cover emergency response efforts after the blowout. 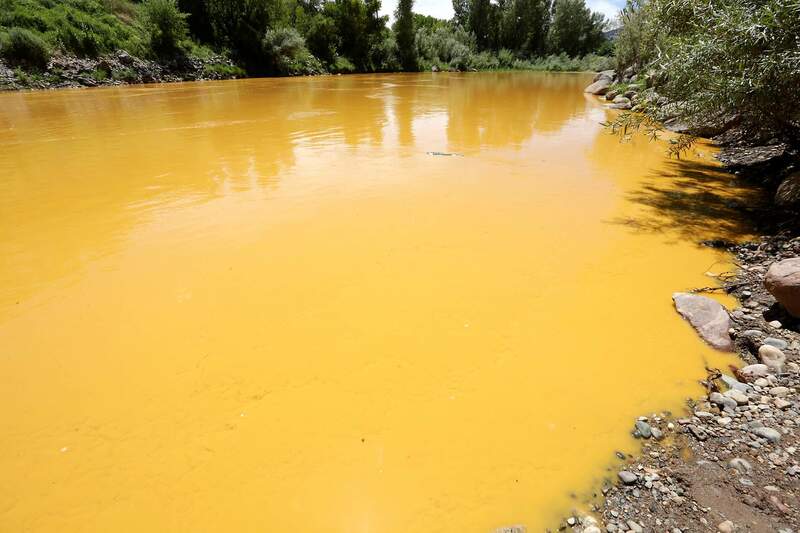 DENVER – A $1.5 million bill sent by New Mexico to the Environmental Protection Agency on Friday could be the last chance for federal officials and the state of Colorado to avoid a lawsuit related to the Gold King Mine spill. Meanwhile, Colorado Attorney General Cynthia Coffman on Tuesday asked the EPA to quickly resolve individuals’ claims, which have not been settled more than seven months after the incident. The requests from New Mexico and Colorado highlight the uncertainty that lingers in the aftermath of the spill. New Mexico Environment Department Secretary Ryan Flynn told The Durango Herald on Tuesday that his researchers reject assertions from Colorado Gov. John Hickenlooper and Colorado environment officials that the Animas River quickly returned to safe pre-event conditions after the Aug. 5 spill of toxic heavy metals. The rift between New Mexico and Colorado is a departure from the unity promised when Coffman hosted the attorneys general of New Mexico and Utah in Rotary Park in Durango just a week after the spill. Hickenlooper famously drank from the Animas River days after the spill to signal that Colorado’s researchers believed the water was safe. “The state of Colorado, without any evidence whatsoever ... continues to say that the river has returned to pre-event levels. We strongly disagree with that statement,” Flynn said Tuesday. “We think that the evidence clearly states otherwise. He said his department is prepared to head to court if the EPA does not reimburse New Mexico for the short-term emergency response work. New Mexico also asked the EPA to provide financial and technical support for a long-term monitoring plan it developed in partnership with Utah. And the state wants a seat at the table for ongoing Superfund discussions. “If we can’t come to alignment on those issues, then ultimately the state of New Mexico will have to do what is necessary to make sure our communities are protected,” Flynn said. Coffman said her office has been in communication with New Mexico. Coffman’s letter to EPA Administrator Gina McCarthy expressed concern for EPA’s “apparent failure to process claims of citizens” affected by the spill. Fifty-one claims from individuals totaling nearly $5 million have not been paid, despite the EPA promising to “make every effort” to respond quickly. In January, New Mexico officials filed a notice of intent to sue the EPA and Colorado. A lawsuit could come as early as mid-April. Colorado would become entangled in the lawsuit, as Flynn and attorneys for his department suggest that the state is liable for the incident. He added that his office is working “in lockstep” with New Mexico Attorney General Hector Balderas’ office. The EPA has acknowledged fault for the spill, in which an estimated 3 million gallons of orange mining sludge flowed into creeks and rivers during restoration work at Gold King. The Animas River tested for initial spikes in toxic heavy metals, including arsenic, lead, copper and aluminum, to name a few. The flow headed into the San Juan River in New Mexico and Utah. Colorado officials with the Department of Natural Resources have maintained since September that its Division of Reclamation, Mining and Safety was never on board with the EPA’s restoration plan. The disagreement came to light after the Aug. 24 release of an internal investigation by the EPA that determined that the Colorado Division of Reclamation, Mining and Safety agreed to put drainage piping through the entrance of the mine, contributing to the spill. For its part, Colorado state officials submitted a request to the EPA for reimbursements of approximately $315,000. The request is being evaluated. Separately, the EPA made initial payments of $197,792 to La Plata County and $220,000 to San Juan County. Another $71,571 is pending to the San Juan Basin Health Department. “EPA continues to work with these entities, the city of Durango, the Southern Ute Indian Tribe and the states of Utah and Colorado to evaluate further requests for funding,” said EPA spokeswoman Nancy Grantham. The EPA also is working with states and tribal governments to allocate $2 million for water-quality monitoring, according to Grantham. She added that the agency is addressing New Mexico’s $1.5 million request.